Fe2p overlaps strongly with Ni LMM Auger peaks, e.g. in some steel samples. Can use weaker Fe3p or Fe3s peaks instead for quantification. Some compounds/alloys of iron are magnetic. Degauss samples if possible before analysis. Iron oxides are readily reduced by argon monomer sputtering. Use lowest possible ion beam energy when attempting to clean oxide sample surface or during depth profiling. Minimizes (but does not completely prevent) reduction effect. Fe2p region has significantly split spin-orbit components (Δmetal=13.1eV). Fe2p peaks have asymmetric shape for metal. A well resolved Fe2p3/2 spectrum for metal shows multiplet splitting. Second component (shifted by 0.9eV from main peak) can be neglected when fitting typical mixed oxide/metal spectra. Fe oxide peaks are significantly shifted to higher binding energy than the metal. Fe compounds can be reduced by Ar ion sputtering, even at relatively low ion energies. 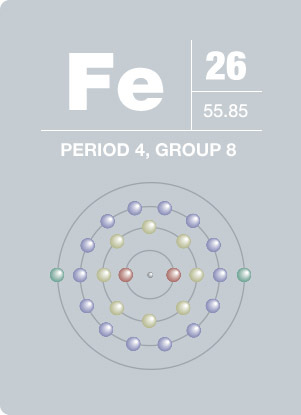 Iron compounds may be described as high-spin or low-spin (as defined by crystal field theory). 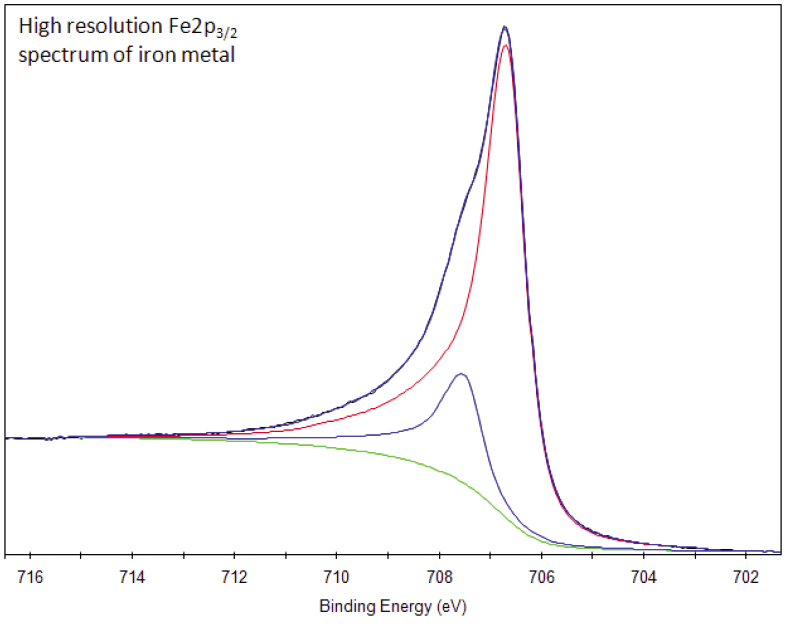 Fe(III) compounds are always high-spin, leading to complex multiplet-split Fe2p spectra. Fe(II) compounds may be high or low-spin. Fe2p spectra of high-spin compounds (e.g., FeO or FeCl2) exhibit complex multiplet splitting and have satellite features. Spectra from low-spin compounds (e.g. FeS2) do not show multiplet splitting or satellite features. 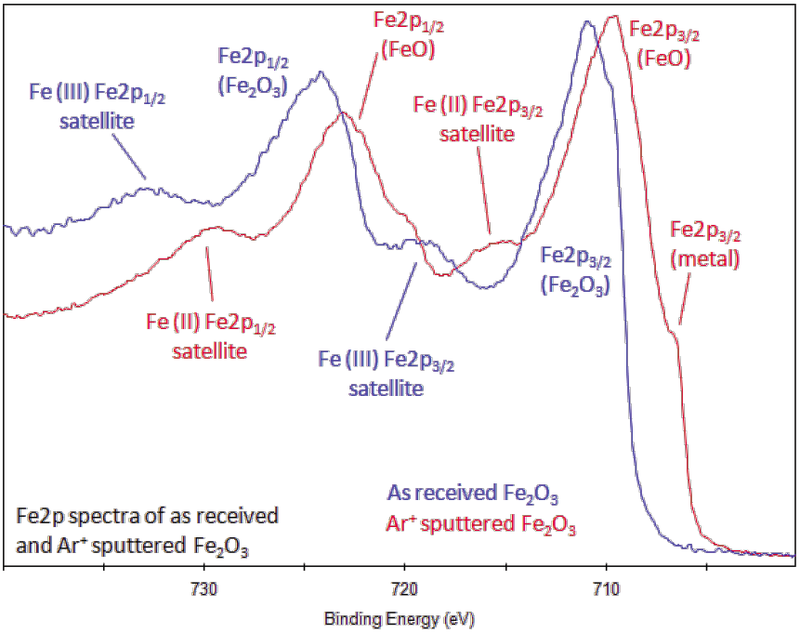 It is possible to distinguish Fe oxidation states using satellite features of Fe2p. The relative binding energies and intensity ratio of the core level XPS peaks versus satellite features will vary according to compound, e.g. FeCl2 has a very strong satellite feature compared to FeO. In the case of air-exposed marcasite (FeS2), no satellite feature is observed since the Fe2+ is in a low-spin configuration. The broad structure to higher binding energy (~710.5eV) of the main Fe2p3/2 peak is NOT satellite structure but is due to Fe3+ states from oxidation of the surface. 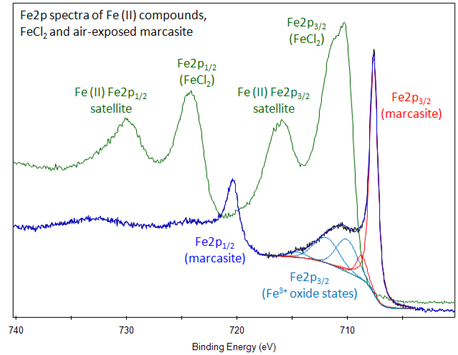 The higher binding energy, smaller marcasite peak (708.4eV) is possibly due to electron-deficient Fe2+ sites, created by the breaking of Fe-S bonds. Comprising 35% of the Earth’s mass, iron is the main component of steel and the most used of all the metals. Iron can take on many forms, including cast, wrought, and pig iron, but suffers badly from rust if not protected in some way. Iron is a necessary trace element used by all known living organisms. In mammals and other animals, hemoglobin is the iron-containing metalloprotein that carries oxygen in red blood cells. Good sources of dietary iron include meat, beans, and leafy vegetables; however, excessive amounts of iron in the body can lead to cell damage and eventually long-term organ damage or even death.